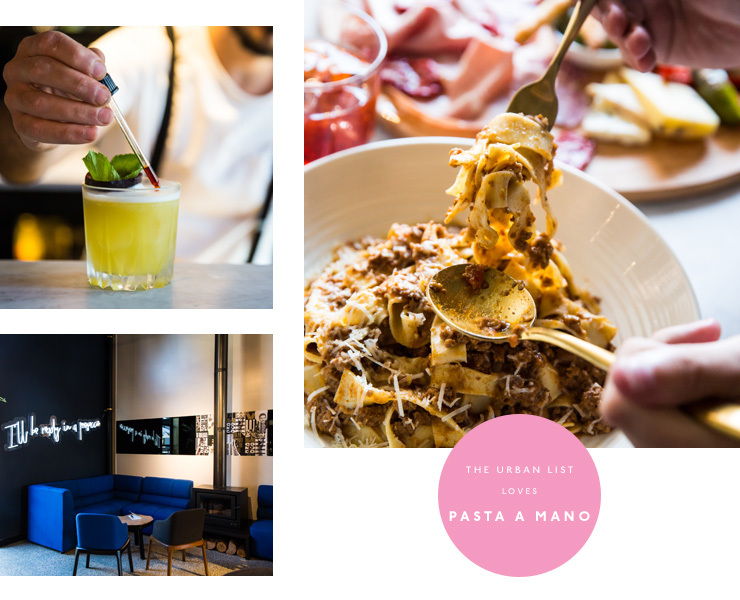 When we heard a dedicated Italian pasta bar was opening ‘round the corner from Urban List HQ, we had to stop the whole team charging over to consume their body-weight in gnocchi. Pasta and cocktails are two things guaranteed to get us frothing, and Ms Frankie has both in spades. You’ll find this place on Cremorne St in Cremorne (the founders of Cremorne weren’t known for their imagination). It’s just down the road from South Of The Wall and Sloane Ranger, two other highly excellent venues. In fact from the street it doesn’t look like much—you have to push through the big glass door to really appreciate the fit-out. The team have done an amazing job with this space. You’ve got soaring, 5m industrial ceilings, terrazzo stone on the floor, white marble table tops and lounges decked out in crushed blue velvet. The space is kind of divided into three parts—there’s the lounge up front, where you can sit and sip Pinot, maybe nibble on some salumi platters. Then there’s the restaurant proper, full of dark timber tables and scattered greenery. Down the back, you’ll find a dedicated function space (again, more marble) that looks out onto a custom ELLE street art (it’s the Virgin Mary eating spag bol, just FYI). Ms Frankie isn’t trying to be your standard Friday night Italian. There’s no pizza for one thing. Co-owner Melinda Aloisio wanted to recreate that feel of her Mamma’s homebaked bread (made in the family garage), the aroma of a traditional sugo wafting through the kitchen, the taste of Purpetti meatballs at a family dinner. Most of all, she wanted to make damn good pasta. The Pasta at Ms Frankie is made a mano (by hand). Piera Pagnoni has been making pasta in Bologna since she was six years old, and there’s not much she doesn’t know about the process. Her Bolognese tagliatelle is an absolute must—the secret is fewer tomatoes and a little butter and milk to finish—but the gnocchi ragu is also pretty hard to go past. Most of the pasta dishes are super simple (a handful of ingredients, seasoning, a little water), but the execution is crazy—you could be sitting in a Bologna palazzo, or sipping wine on the Amalfi Coast. This isn’t pasta like Tipo 00 does it—it’s more Nonna-style. Uber traditional, simple ingredients, prepared with love. Of course, if pasta isn’t your thing, there’s a great Starter menu too. The Roman-style porchetta is something you don’t see on many menus, but personally, we recommend the Fritto Misto (crunchy fried school prawns and calamari, served with a tangy aioli) or the salumi board (seriously, on of the best we’ve had in a LONG time). Save room for dessert, whatever you do. You’ll have your work cut-out choosing between housemade ricotta cannoli, blood orange and salted caramel pannacotta and the Nutella Sundae. Probs best to order all three for the table and fight over them like gladiators. Drinks-wise, there’s an excellent selection of local and imported wine. Obviously, Italian vintages feature pretty heavily—big, hefty reds to compliment your pasta sauce—but check with your waiter if they’ve got any interesting new bottles in. The range is changing all the time. One last thing, we asked Piera Pagnoni her secret to the perfect Bolognese (she was horrified to discover we’d been adding tomato passata for years). Apparently, the trick is to brown your meat, onions, garlic, celery and carrot, add red wine and reduce. Then a teaspoon of tomato paste (seriously, no more). Top up with water, add a couple of bay leaves, and leave to simmer. Right at the end, you can drop in a nob of butter and a little milk (Piera also suggested the rind from a good quality parmesan). That’s it. Super simple, but damn the results were impressive. If you want to see how pasta should be done, head on down to Ms Frankie. Say hi to Piera for us.